These are the steps you need to follow to set up your Thunderbird email client for your QMUL email account. NOTE: Currently some users will find that their client may not automatically find the correct settings. This is a problem IT Services are working on to resolve. 1. Start your Thunderbird client. 4. Enter Your name and your QMUL Email address (eg qm.staff@qmul.ac.uk) and QMUL Password. 5. Don’t forget to tick the Remember password option before clicking Continue. 6. If successful you will be able to click Done to complete the email set up and start using your account. 8. 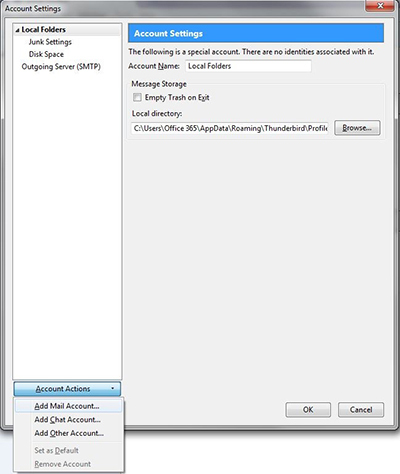 Amend Incoming IMAP server hostname to ‘outlook.office365.com’ and Outgoing SMTP to ‘smtp.office365.com’. 9. Change the Incoming port to 993 and the Outgoing port to 587. 10. Change the Incoming SSL to ‘SSL/TLS’ and the Authentication to ‘Normal Password’, and the Outgoing SSL to ‘Autodetect’ and Authentication to ‘Autodetect’. 11. 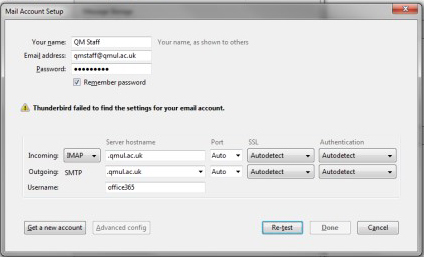 Amend the entry for Username to your QMUL username including the '@qmul.ac.uk' suffix (eg abc123@qmul.ac.uk). 13 .Click Done to complete the email set up and start using your account.